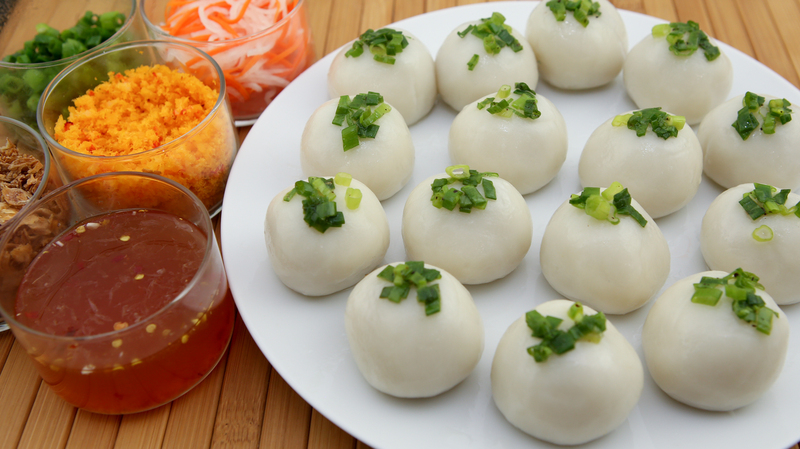 Here’s an easy-to-follow recipe for Sticky Rice Dumplings (Banh It Tran), a popular Vietnamese savory dumpling often enjoyed as a snack or small bite. Vietnamese cuisine is replete with snack foods, small bites and casual eats and these savory dumplings are some of the heartiest and most addicting treats. 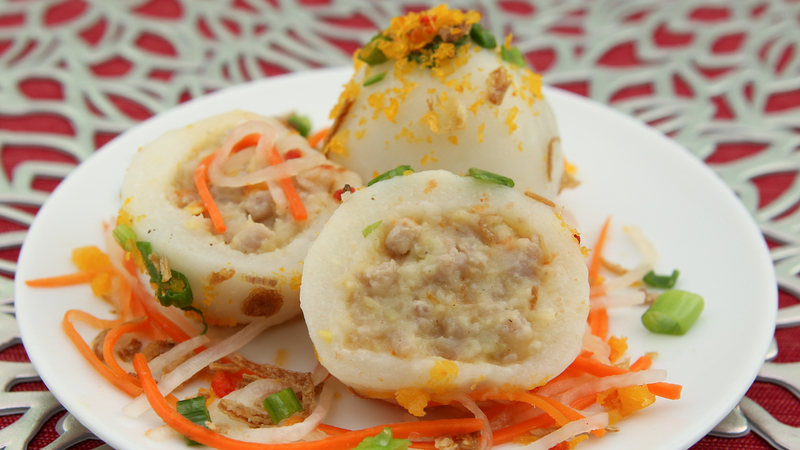 The glutinous dumplings are filled with seasoned ground pork and mashed mung bean. Topped with scallion oil, fried onions, toasted shrimp flakes and served with tart pickles and zesty fish sauce dipping sauce, these scrumptious morsels are bursting with tantalizing flavors and textures! To save time, make the mashed mung bean a day or so ahead and store in the refrigerator. If the mung bean is a bit thick from being refrigerated, add 2-3 Tbsp hot water and combine until the mung bean is a thick paste again. 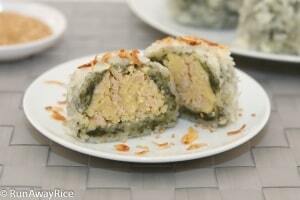 The traditional recipe uses ground pork but feel free to use any ground meat you like, such as, chicken or turkey. Optionally, omit the meat entirely and double the mashed mung bean recipe for an all vegetarian option. When heating the water for the dough, make a little bit extra just in case you were a bit loose with the dry ingredient measurements. Be careful not to add extra water initially. Once the dough softens, it can become sticky very quickly. If this happens, just sprinkle in a bit more glutinous rice flour. The hot water is heated to a temperature of approximately 140 F (60 C). Be sure to cover the dough completely during the resting period. Do not let it rest for more than 1 hour as it may be dry. The dough is dry if you are seeing cracks when shaping the dumpling. Here’s how to fix a dry dough: wet your hands with a little bit of warm water and massage a dough section for about 15-20 seconds before shaping the dumpling. This little bit of water will help to hydrate the dough. On the flip side, a wetter dough makes deliciously soft and chewy dumplings. Make sure the dough isn’t so soft that it loses its shape or oozes when the sticky rice dumplings are formed. If this is the case, work in a little bit of glutinous rice flour to stiffen the dough. This dough is pretty forgiving and really easy to work with. When shaping the dumplings, smooth the dough snugly around the filling ball. Avoid over-stretching the dough and making the dumpling skin too loose. Excess dough or air pockets between the dough and filling may cause the dumpling to burst during boiling. See my video for more dumpling forming tips. 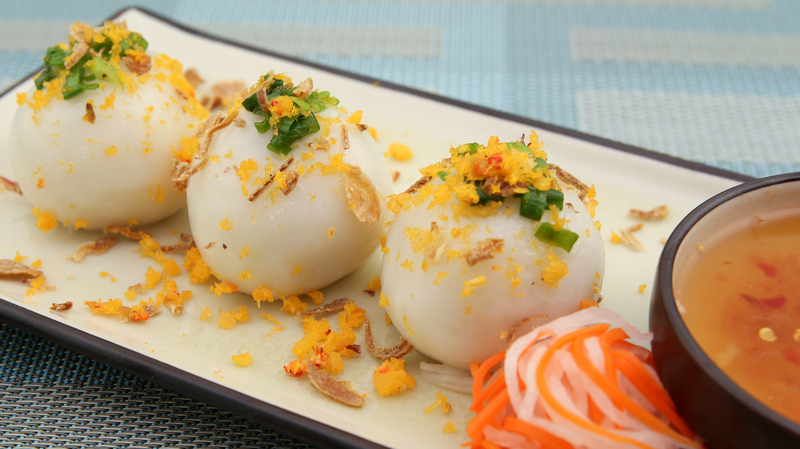 Refrigerate any leftover Sticky Rice Dumplings and enjoy within the week. To reheat, warm in the microwave for 45 seconds to 1 minute using Low power. Optionally, steam or boil for 2 minutes. Freeze the dumplings for up to 3 months. See the video for my trick for freezing these dumplings so they don’t stick together. These dumplings freeze really well so I love making extra and storing in the freezer for days when I don’t have time to cook. To enjoy again, allow to thaw and reheat as per the instructions above. Transfer the mung bean into a large bowl and fill with cold water. Wash the beans by swirling in the water and then pouring out the rinse water. Repeat this process 2 more times or until the water is mostly clear. Fill the bowl with cold water and let the beans soak for 2 hours. Transfer the cooked beans to a medium bowl. Using a paddle spoon, quickly mash the beans while they are still hot. Set aside for now. Separate the green onion roots from the stems. Finely chop the root portion. Chop the green onion stems and transfer into a small bowl. Set this bowl aside for making the Scallion Oil later. In a medium bowl, add the ground pork, half of the chopped green onion root, half of the chopped shallots, salt, and 1/4 tsp ground white pepper. Mix together combining all of the ingredients well. Heat a medium wok over Medium High heat and add the vegetable oil. Add the remaining chopped green onion root and shallots and stir-fry for 15 seconds. Add the seasoned ground pork. Cook the pork while stirring constantly. Break up any large chunks of meat using a wooden spoon or spatula. Cook until the pork is no longer pink, approximately 3-4 minutes. Add the mashed mung bean prepared earlier and combine together. Season the filling with the remaining 1/4 tsp ground white pepper and combine together again. Turn-off the heat and let cool for 5 minutes. While the filling is still warm, scoop out heaping tablespoons and transfer to a large plate. Make a total of 18 mounds. Roll the filling mounds between your palms forming a rough ball. After all filling balls are made, cover with plastic wrap to keep from drying. Heat the water in the microwave using High power for 1 minute. Into the mixing bowl, add the glutinous rice flour, rice flour and salt. Using the dough hook attachment, mix on Low speed for 15 seconds. While mixing on Low speed, gradually add all the hot water. Scrape around the bowl to work in the dry ingredients and continue mixing on Low speed. After 2 minutes, a soft dough should start to form. Scrape around the bowl again. Check the dough: it should be tacky to the touch but not stick to your fingers. Add 1/3 Tbsp (1 tsp) vegetable oil. Mix on Medium speed for 20 seconds. Transfer the dough to a work surface. Shape into a log about 9-inches long and 2-inches wide. Cover the log with plastic wrap and let rest for 30 minutes. Use a ruler to divide the log in half lengthwise. Score the log into 1-inch increments. Using a pizza wheel or knife, cut the log into 18 equal pieces. Separate the dough pieces. Cover with plastic wrap to prevent drying. Take a dough section and flatten slightly between your palms. Use your fingers to flatten the edges, making a circle about 3-inches in diameter. Place a filling ball in the center of the dough circle and wrap the dough around the filling. Pinch the dough together to cover the filling completely. Roll between your palms to form a smooth ball. Continue with these same steps until all dumplings are made. Bring a large pot of water to a rapid boil. Add 1 Tbsp vegetable oil to the water. Transfer the sticky rice dumplings into the pot. Stir the dumplings gently so they don’t stick to the bottom. Boil the dumplings over Medium Heat stirring occasionally. In about 7-8 minutes they dumplings should start floating to the top of the water. After all dumplings float to the top, continue boiling for 2 more minutes. Prepare a serving plate by coating it lightly with vegetable oil. Make an ice bath by filling a large bowl with cold water and adding ice. Transfer the boiled dumplings into the ice bath. Swirl in the cold water for 2 minutes. Transfer the sticky rice dumplings into a large colander and drain off the excess water. Transfer the dumplings onto the oiled plate. Brush each dumpling with a little bit of vegetable oil. Add vegetable oil to the chopped green onion stems prepared earlier. Add a dash of salt and pepper and combine together. Microwave on High for 20 seconds. Top each of the dumplings with a little bit of scallion oil. 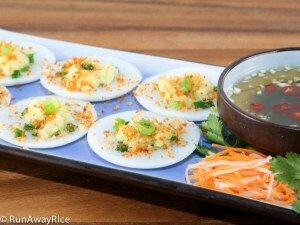 To serve, transfer a few sticky rice dumplings onto a plate. Sprinkle with fried onions and toasted shrimp flakes. Add a small helping of the carrot and radish pickles. Serve with a side of the fish sauce dipping sauce. 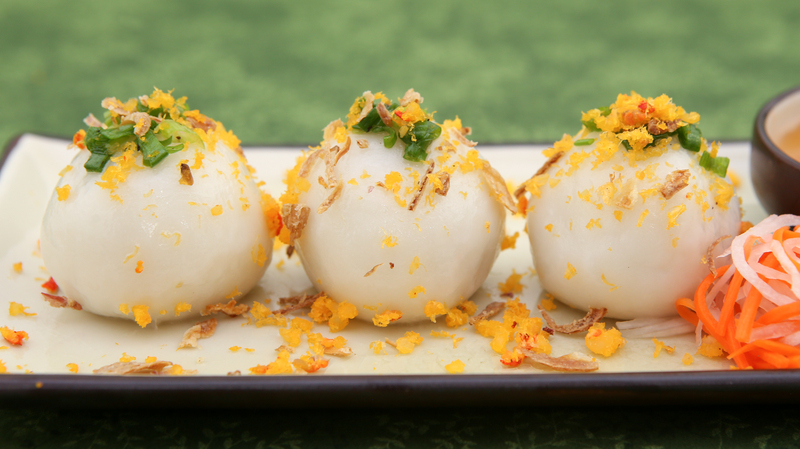 Refrigerate any leftover Sticky Rice Dumplings in the refrigerator. To reheat, warm in the microwave for 45 seconds to 1 minute. Optionally, steam or boil for 2 minutes. Freeze the dumplings for up to 3 months. This week I didn’t see you are posting a good dish yet, miss a lot. Hope you be back to this system. Waiting ok, Thks. 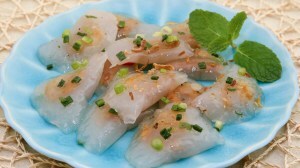 Hello chi Trang, I notice you use Mochiko sweet rice flour instead of the typical sweet rice flour from Thailand. I wonder if the Mochiko brand is better? Thank you! I like the Mochiko brand for this recipe. This sweet rice flour yields a softer and plumper dumpling. The Thai brands will work just a well. Hope you give this recipe a try. These look really good! I can’t wait to try them! I would LOVE to have these in my freezer for something really good after work!! Maybe I’m an oddball, but at Chinese buffets (or indeed anywhere else! ), the kind of dumplings I like best are the doughy ones and not so much the fried ones! I’ll let you know!!! Looks delicious! Excited to try this out!